← How to Backup WordPress to Dropbox? I have used a couple of media servers to stream my movies and music collection from my desktop to our Sony Playstation 3 and watch it in our big screen TV. TVersity and PS3 Media Server have worked well for their purpose. I have also dabbled with XMBC a little. However, with our 2 week old son I am catching up on TV shows and movies more on my Apple iPad than on my TV. So, I download those videos to my iMac and stream to my iPhone or iPad over our home WiFi network. So, I have been watching out for different solutions to make this easy. That’s when I came across Plex Media Server. Plex Media Center is available for both Windows and Mac for free. It transforms your media collection into an elegant easy to use media server setup seamlessly. The first thing you’ll notice after you install the server is the beautiful interface. Plex supports playing a wide variety of video formats without the need for special codecs and plugins. You can even stream online audio and video content. The best thing about Plex is it’s ability to download metadata for your media files from the Internet making your media library look better than ever. The server can update automatically when new content is added to your computer. Plex shines in the mobile access with dedicated iOS and Android apps. With the Plex iOS app, you can access your media server contents from iPhone, iPod Touch or iPad. 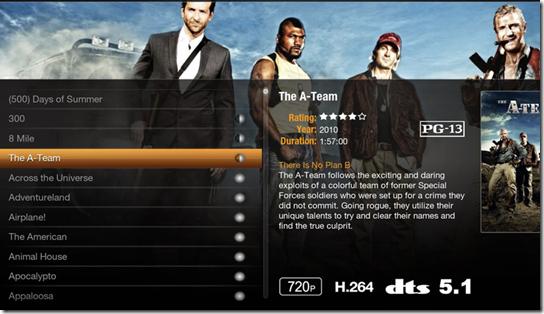 In fact, Plex is being loaded into LG’s 2011 Netcast enabled HDTVs and LG Smart TV Upgrader. This is incredible news for this platform.